To this, works for me. Not quite done the other side of the room yet. Still working on it. Oh you have a way....a way of creating an environment. Simply lovely. Have I commented here before? I should have. Because I want the green hutch and headboard! 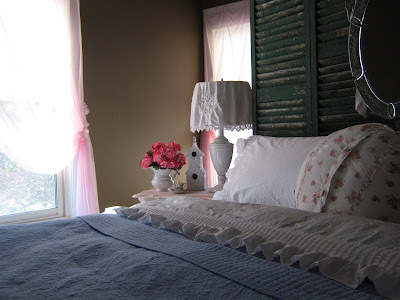 My husband is always scouring junk shops to find shutters saying "This would make a great headboard!" The great news is that I'm in Maine and you can send your hutch to me!! How cool is that? In fact, I'll just come pick it up. It'll be great in my dining room. Thanks! Seriously, have enjoyed perusing your blog via CDW. Lisa, this is absolutely STUNNING! I am a sucker for sheers, anyway. How did you hang them from the ceiling? That is a fabulous transformation! Beautiful! Hi, I see your comments everywhere so thought I would stop by for a visit. How about I share some coffee while I'm here? 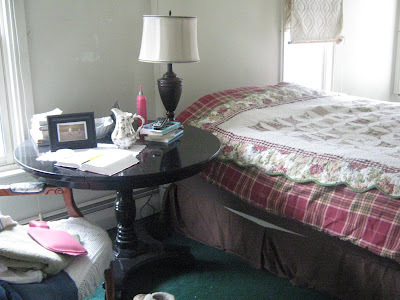 Your room looks great, I have the red checked, scalloped quilt. 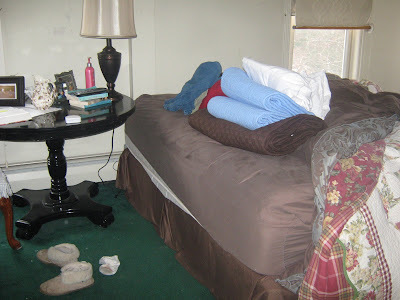 It used to be on my bed too, but now the kids use it for their "weekend stay" in the family room floor. It is so pretty, I may use it again one day! Hope you have a great weekend. Stop by for a visit sometime. 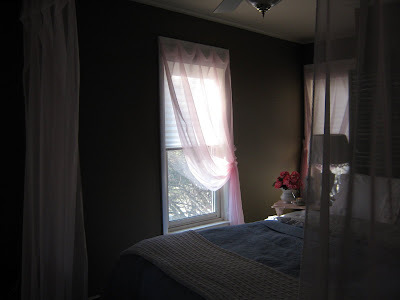 Wow, that is just so beautiful....you have such an amazing talent for totally transforming a room. 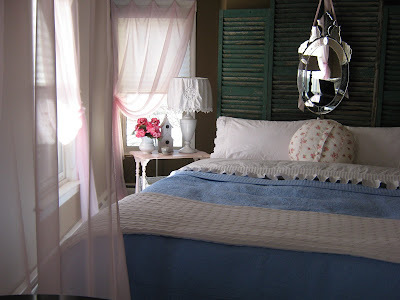 Very creative; I just love the headboard, and the way you hung the sheers up in the room, not just over the windows....that adds a whole new look to the room....like a getaway. Oh.... my I LOVE before and after shots! :) Your new room is BEAUTIFUL!!!! So serene, peaceful and calming it looks.... a haven of rest, indeed!!!! This is amazing!!! I love, love, LOVE it. You wanna come to my house and help me??? I don't know if you've ever seen this blog, but I bet you'd like it. They are also having a giveaway right now. What an awesome job you did!!! I love the color of the walls!! 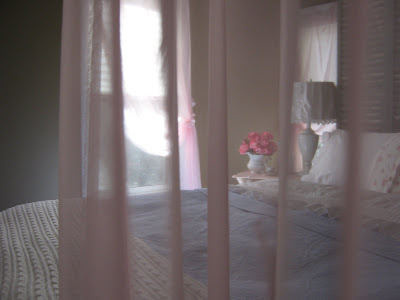 Sheers are my favorite curtains and i love what you did with them around the bed, so eloquent!!! Thank you for sharing! OH WOW... the tea cup has it's wonderful new home... 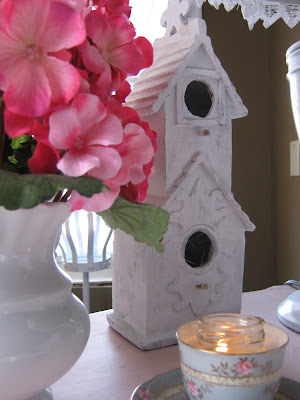 I just was catching up on your blog and saw it... how nice it has all come together... you are very talented!! !